If you were on a sports team that was invited to the White House, would you go? What makes our city better than any other city? Why do you think (name a college) is so much better than (name of different college)? Most of our groups are diverse; we just don’t always recognize it. Not everyone in the group agrees on every issue. There may be people with different races, political views, hometowns, genders, occupations, levels of income…you get the picture. That diversity impacts our group in both negative and positive ways. Let’s look at the potential negative impacts, or distractions, of diversity. Can limit some discussion. I lead a co-ed class of married couples. If a husband states his opinion, his wife will rarely disagree with him unless I force the issue. She will wait for the car ride home to finish the discussion, without the group gaining insights that might have needed to be heard. The relationship outweighs the diversity. Some people will not take the risk of stating their beliefs if they know someone may disagree. Diversity multiplies the possibility of disagreement. Can give the rabbit chaser a weapon. Almost every group or class has a rabbit chaser. He or she likes taking control of the discussion by focusing on some minor point (the rabbit) that ultimately has no bearing on the study. During a study of Jesus’ birth, a rabbit chaser focused on how much time was required to walk from Jerusalem to Bethlehem with and without a donkey. He fed off the diversity of the group, calling on the runners and a couple who raised horses to help him with his calculations. He pitted the two against each other, using the diversity as a weapon to avoid talking about the deeper truths in the Bible passage. Focus becomes the differences more so than the points of agreement. So many times we find ourselves looking for the differences to the exclusion of finding some common ground. We would rather focus on our disagreement over the details of the return of Christ than affirm that we both believe that He is coming back and that all believers will spend eternity with Him in heaven. Now for some positive impacts of diversity. Learning from the experience of others. A diverse group moves us away from group think, allowing for different perspectives to be explored. Group think discourages critical thinking. The diversity gives each individual a point of comparison of his or her unique experience and understanding of those experiences. In effect, the group becomes a living case study for each individual involved. Way to discern universal truths. As people with diverse backgrounds explore truth together, they will discover universal truths. They will discover some ideas and truths cut through all of life circumstances. They may have seen God’s love and grace demonstrated in different ways, but that is the point….God’s love and grace is always demonstrated regardless of a person’s race, gender, or hometown. Makes it easier for the group to connect with new people. Diversity broadens the connection points for others. When a new person attends a group, they are looking for someone with whom they can connect. The more diverse the group, the more likely there will be someone with whom a new person can connect. What would you add to these lists? How can you minimize the negatives and build on the positives? A friend invites us to attend a Bible study group. We hear all about the relationships, spiritual depth gained, and ministry opportunities that await us. We decide to attend and soon discover that becoming a part of the group will be more difficult than we thought. We wear a handwritten name tag (everyone else has a printed tag), get asked to introduce ourselves to start the group time, and then find out we were the only ones that didn’t get the text about bringing your own cup if you wanted coffee. 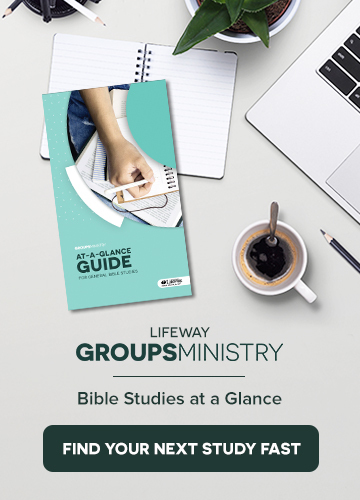 Most of us who lead a Bible study groups ministry at least advertise that our groups welcome anyone. We would like to think that any person can find acceptance and a place in a Bible study group. Unfortunately, “anyone welcome” is an apparitional goal at best in many groups. What are some things we can do as a leader to move the groups towards being more welcoming of everyone? To begin with, take an inventory of the stories used to illustrate points during the Bible study. Most of us use stories from our experiences and interests…and we should. Doing so helps the group get to know us and builds trust between the group and us as the leader. But shouldn’t we strike a balance? How many of the stories used relate to people exclusively from our background and interests? Nothing wrong with loving sports for example, but all our illustrations shouldn’t be from the sports world. Secondly, look at who helps us manage the group. Is there diversity within the team, or are they all like us? Most of us gravitate toward people with the same interests and goals, so it makes sense. However, if we want our Bible study group to be inclusive, the leadership team ought to reflect who we are seeking to reach. Just look at the group Jesus assembled as His disciples and we find all kinds of people—fishermen, a tax collector, a political activist, and a thief. He assembled a diverse group on purpose. Thirdly, observe who and how we engage people. Most of us tend to find it easier to talk to some people than we do with others, but as the leader we need to try to engage with everyone present. That begins with awareness and prayer. Asking God to help us see all people as people is a dangerous prayer since God tends to put people in our lives to find out if we are serious about that request. How we engage someone may be more important than who we engage. We must learn to treat others as people who have real needs, real reasons for why they believe what they believe, and real stories worth telling. Fourth, we can become a student of cultures and subcultures. Read blogs and books by people with whom we know we will disagree and who come from a different background. Learn to be comfortable asking about a person’s background, memories, and values. We can all learn a great deal by talking to people if we simply take the time to do so. Here’s the bottom line, creating an inclusive Bible study group starts with us as the leader. The rest of the group takes their cues from us. They know who we talk to the most and to whom we respond the best. They watch how we handle others who answer questions in a combative or reactionary way. We set the standard even when we don’t want to. What are some things you have found that help you foster inclusive mindset in your group? A prevalent debate among educational circles is that of the role of the teacher. Some view the teacher as the expert ready to dispense information, while others see the teacher as a fellow learner, spurring students on to learn alongside him or her. Words like “leader,” “mentor,” “provider,” “coach,” “nurturer,” “motivator,” and “guide” are used by different scholars to describe the teacher’s role, with each term implying various responsibilities. Historically, the role of the teacher in adult Sunday School groups has been that of the content expert who clarifies, redefines, and shares additional information with the group. In effect, the teacher is the source of authority within the group. This role is assumed when the expectation is that everyone has studied prior to group time. Thus, the purpose of the group gathering is to go deeper into what members have already discovered in their personal time. This methodology requires the teacher to have more information than the most learned group member. The pressure of being the resident expert every week can be daunting, causing many who lead to never consider the possibility. This approach has a proven track record, but it requires teachers who are willing to invest in rigorous study. There is another way. Let’s imagine that the expectation for group members is that they attend the meeting without first studying the week’s Bible passage. The only person expected to be prepared is the teacher. Here, the teacher is not “the expert,” but instead introduces the group to the passage and sets the pace for members to go through deeper study in the days following group time. The teacher does not need to go into the deeper points, but could if he or she desires to do so. The teacher is an expert in his or her role as introducer; this role allows the teacher to grow as an expert in the craft of teaching, and not the weekly content. Certainly, the teacher has studied and prepared to lead the group, but his or her biggest responsibility is to challenge individuals to take the next steps of reflection and application. And by being an introducer, the teacher also learns alongside group members. The Explore the Bible Daily Discipleship Guide is one example of how the second approach of teaching can be resourced. With the Daily Discipleship Guide, teachers are given a reliable, simple resource to introduce the Bible passage to group members, and are given the opportunity to go deeper alongside group members. The Daily Discipleship Guide allows each group member to become a content expert, but to do so in a way that helps him or her incorporate the truths discovered in his or her personal life. In this approach, everyone becomes a resident expert in the days following the group time, removing some of the pressure felt by teachers.